You can glean a lot about someone from their art. The reasons why they paint, their inspirations or perhaps, the story that they want to convey. Well, this was particularly true for the aboriginal people who lived way back when. Even though much of their art was drawn on rocks rather than canvases and certainly not to earn a quick buck, their art taught me a few things about them. Once we arrived in Darwin, the first stop of our well-planned travel itinerary was the Museum and Art Gallery of the Northern Territory. It turned out to be a great way to be introduced to the Northern Territory as it houses an extensive collection of aboriginal art with carvings, bark paintings from the Arnhem Land as well as dot paintings from the desert. I had noticed in our itinerary that we had been told specifically not to photograph the aboriginal art. Although I respected the decision, I did wonder why they had imposed such a restriction. After all, showing a few pieces would certainly be a great way to attract visitors. So I slowly scrutinized the stories behind each piece. Here, I read about a secret and sacred ceremony by which a painting of two wallabies was associated with. Yet another artwork was created as a replica of a narrative of events that occurred at a sacred site and was a story was to be passed down to the generations after them. As I browsed the various pieces, I began to understand that though it seemed restrictive, the artwork was sacred and needed to be protected given their association to their rituals. They weren't just creations of art. In fact, each piece was not just important to the person who created it but the people that it belonged to. The story behind each piece gave me a deeper perspective into the people and their beliefs. I must say that reading their stories made me think about whether I was making enough of an effort to pass on my stories to my children but more on that later. In addition to the aboriginal art, on display were tools, weapons and utensils that were used in hunting, fishing and gathering. Feathered strings were also a common feature in their ceremonial wear. Used for distinguishing which clan you were from, they were considered to be one of the most sacred decorations used in the northeast and central Arnhem Land. 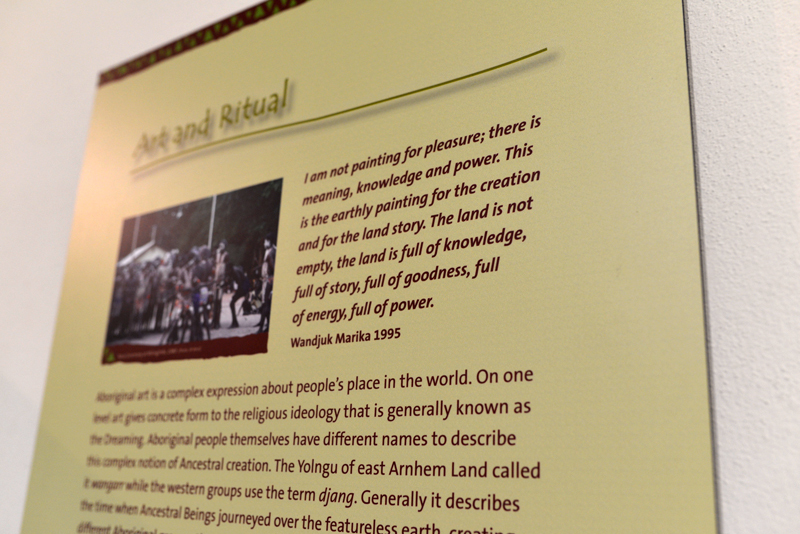 As I was leaving, I spotted this quote by Aboriginal painter, Wandjuk Marika who aptly summed it up, " I am not painting for pleasure; there is meaning, knowledge and power. This is the earthly painting for the creation and for the land story. The land is not empty, the land is full of knowledge, full of story, full of goodness, full of energy, full of power." And I think that sums up how the people of the land saw their lives as intricately intertwined with it. Thus to understand the people, the next best place to head would be the Land. The Kakadu National Park is owned by the aboriginal people who have lived in it for at least 20,000 years. Fortunately for us, the aboriginal owners leased the land to the Director of National Parks which now means that the public can visit the lands that they once lived in. We spent two days in Kakadu. First we visited Nourlangie Rock and then on the second day, we spent some time at Ubirr. At both places, the aboriginal rock art had been preserved ever so carefully and the view of the land was just breathtaking. Also, as we walked through the land, our guide Luke would occasionally stop and tell us stories of how the people lived in the land. 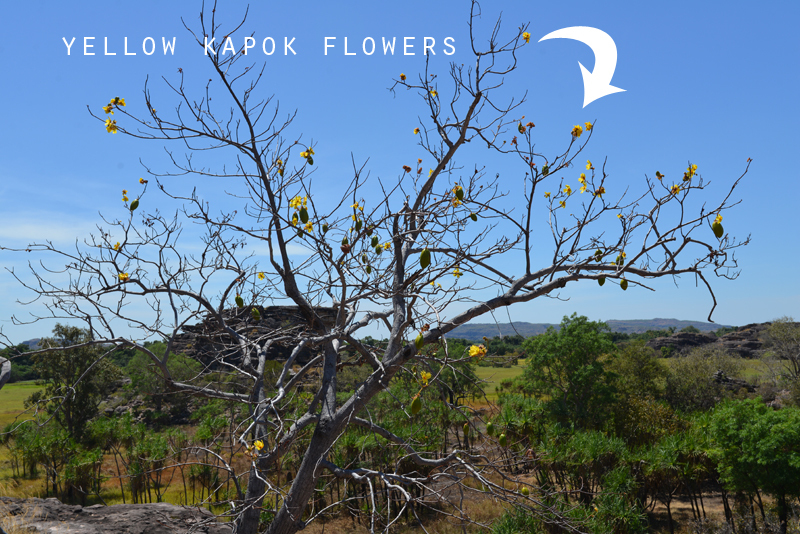 For example, he told us that when the yellow kapok flowers blossomed, it would indicate that the crocodiles have laid their eggs. The indigenous people would then go out to collect them. Isn't that cool? I wonder what scrambled crocodile eggs would taste like. 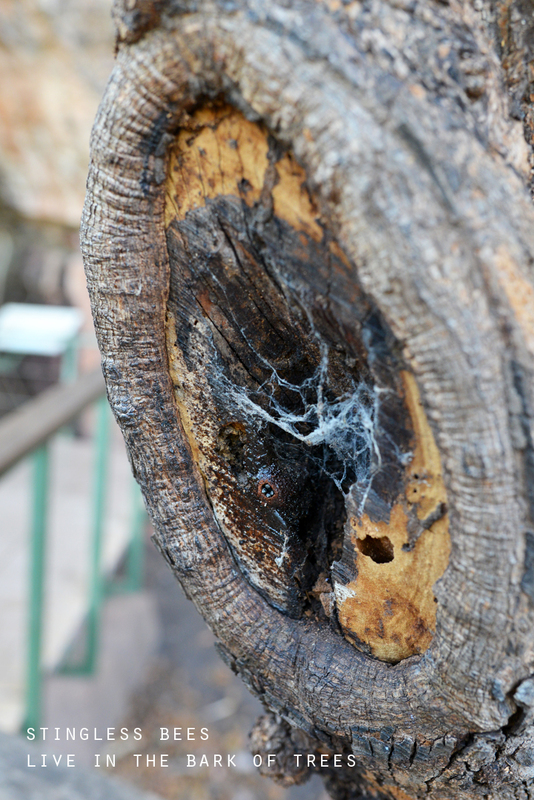 We also stopped to check out some tiny bees that lived in the bark of a tree. Luke asked us to place our ear at the hole so we could hear the buzzing. At first, I wasn't sure how safe that would be but since Luke had done it, I decided to try it. It was pretty cool. (I just managed to confirm, with the help of google, that the bees are stingless so it was very safe after all!). In the past, the indigenous people would attach a white feather to the buzzing bee and follow it back to the hive. Then they would make a small hole in the hive, remove some honey (or sugarbag) and then place a cork in the hole so they could come back for more next time. Imagine if you had a little tree full of honey in your backyard. That would be so brilliant. I really enjoyed listening to their stories of survival. But of course, we were there to see the rock art. Distinguished into 11 main artistic styles, they are recognised to have taken place across three environmental periods . You will notice that the rock art was rather simple (a simple silhouette without any details) during the earlier periods but as it evolved, it became more detailed (backbones were included) and started to include decorative elements and more colours. Interestingly, this might actually correlate with the fact that the estuarine and freshwater period brought animals that were easier to hunt and hence, allowed more time for painting. But at the heart of their rock art was a desire to pass down stories to their little ones. Warnings and advice that would keep them safe from harm and help them live in the land. One such story can be seen in this painting of Mabuyu who reminds the indigenous people to tell this story that warns against stealing. Mabuyu was dragging his catch on a string after a fishing expedition when a greedy person cut the string and stole the fish. That night, Mabuyu waited until the thieves had eaten his fish and were camped inside their cave near the East Alligator River. Then he blocked the cave with a huge rock. Sounds pretty effective to me. If I lived out there in that land, I would be scared stiff. You wouldn't catch me stealing anything! There were a lot more stories similar to this one which provided a peek into their lives. I felt very thankful to be able to get the chance to see all of it. The land there is truly rich and brimming with culture of the people that once lived in it. Thus it is not surprising that the park was placed on the UNESCO World Heritage List. Honestly, the Kakadu National Park should be on everyone's bucket list. After our time in Kakadu, we headed to Uluru which was a wonderful way to cap our time in the Northern Territory. 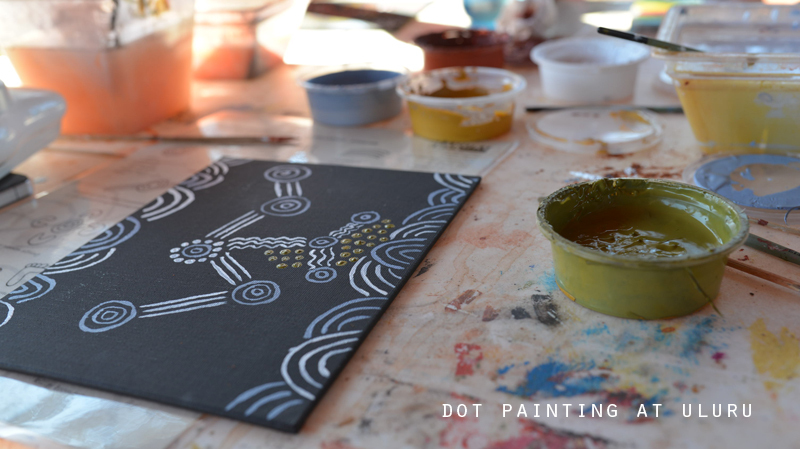 While we were there, our guide, Iris had made arrangements for us to attend a Dot Painting workshop where we would create our own aboriginal art. I had already seen a number of dot paintings at the Museum and Art Gallery of the Northern Territory so I was really looking forward to creating my own piece. But what I didn’t know was that the dots and swirls were actually symbols and each artwork communicated a message that the artist was trying to convey. You can see some of the symbols that we were introduced to in the picture below. Then we were all given a black canvas each to begin painting our own stories. We were told to make it personal and that we could even create our own symbols. It took me a while to conceptualise the piece that I wanted to make but I have always found painting with dots an easy way to control the paint and I was pleased with how it turned out. Finally, we were given an opportunity to present our artwork to the group and tell our 'stories'. I really enjoyed listening to everyone's interpretation of their art and was glad to have learnt a new form of art. 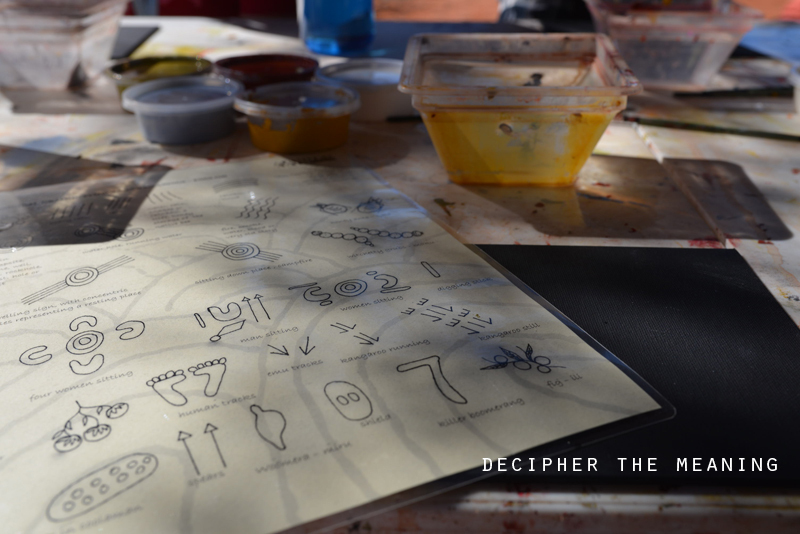 My artwork was a retelling of my journey in the Northern Territory and the places that we visited. I surrounded each place with dots in the dominant colour of the land, white dots for Darwin to symbolise the white streetlights, green dots for the green national park, yellow dots for the termite mounds, red dots for Uluru and finally blue dots and white dots for the stargazing at the Sounds of Silence tour. Creating art with meaning definitely makes it unique and personal and I liked the use of symbols. This was an easy technique that I hope to try again with my kids. If you would like to create your own dot painting, you might find these aboriginal symbols helpful. After our time in Uluru, we headed back to Darwin and had a little time to shop around and pick up souvenirs. While shopping, I stumbled onto a little shop near our hotel, Aboriginal Art Gallery. It was a quaint little shop that housed books and aboriginal art (just like the first image in this post). Each piece comes with a certification and tells you a little bit about the artist. I really enjoyed looking at the range of art available at this art gallery especially after that quick lesson on symbols. So what did I learn about the people through their art? I found that they were a people who were proudly linked to the land that they came from. Many of them would never think of leaving the land. They then passed on that rich culture and identity to the generations after them, stories told by their ancestors and stories that they created for their children. I enjoyed seeing a culture that is quite unlike ours today. Today, we are certainly more mobile than ever before with many options available to us. In fact, leaving our land or perhaps even our families can sometimes be a welcome change. I walked away from this experience asking myself - What sort of heritage am I passing down to my kids? What experiences and stories would I want my kids to hold dear to their hearts and recreate for their kids? I've been thinking about this and hope to share more thoughts later on. * This post is one in a series of posts called NT Travel Memoirs that seeks to record my most memorable moments during my recent trip to the Northern Territory, Australia lest I forget. 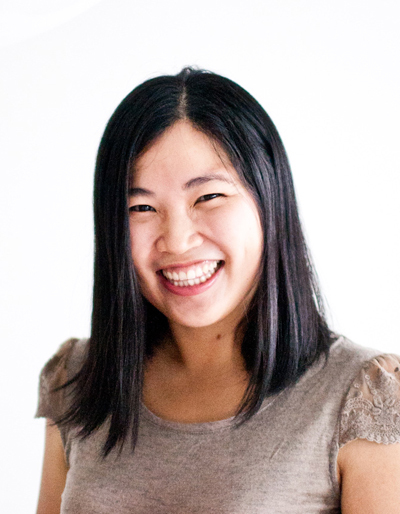 A big thanks to Tourism NT and OMY for sponsoring this amazing trip as a prize for winning the Best Lifestyle Blog at the Singapore Blog Awards 2013.